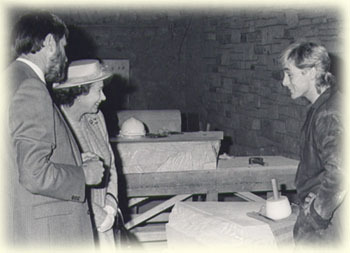 Alba Masonry was established in 1995, the founder of the company, Malcolm Goodwillie served an extensive apprenticeship at Stirling Castle where he was taught by master masons in all aspects of traditional and modern stonemasonry. In the final year of his apprenticeship he was recognised as the best apprentice in Scotland for his year and was awarded apprentice of the year by Ingval Maxwell who is top architect for Historic Scotland. In the course of his apprenticeship he was presented to Queen Elizabeth in recognition for the quality of his work carried out on the great hall in Stirling Castle as pictured. Alba Masonry has carried out all types of building work for example new build, restoration, moulded banker work and much more. Examples of his work can be viewed throughout this website using the navigation at the top of the page. Alba Masonry is recognised as a company which provides the highest quality workmanship.